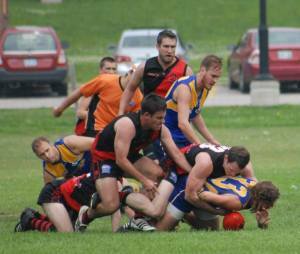 On a scorching, muggy Saturday, the Toronto Dingos dropped their second match in a row to longtime rivals the Toronto Eagles, who managed to outlast the Red and Black by three points in a thrilling / gut-wrenching finale. With the loss, the Dingos fall to 3-2-1 for the season, good enough for 5th on the OAFL Ladder at the half-way point of the 2013 Season. The Eagles remain atop the league with a flawless 6-0 record, along with a massive 225.11 percentage. It was a bumpy start for the Red and Black following the first tap, with the Eagles trotting out a veteran forward line featuring the likes of Troy Marsh and Azza Falcioni that were quick to pounce on some early miscuses by the Dingo backmen. The Dingos quickly found themselves down a couple goals, but after a few rotations by the coaches, the backline righted itself following the lead of Dave Wells and Malcolm Brady, who had the two major defensive assignments. With the backline sorted and holding, the mid-fielders came alive and controlled the footy for 3-5 minute stretches at a time, hemming the Eagles in their own backline and forcing a few set shots. The forwards meanwhile were led by the efforts of Wade Edwards and Mick McFarlane, who attacked the footy with strong leads and tough grabs under pressure, as the Dingos crawled back into the match. The only major weakness for Dingos throughout the first half were the tiny lapses in concentration - an errant handball or muffled kick - that the Eagles were shockingly quick to pounce on. Despite controlling much of the play, the Dingos found themselves racing back after a crucial turnover time and again, with the Eagles executing on almost every opportunity. By the end of the first half, these disheartening snap-attacks got the best of the Dingos, as the Eagles re-established a 3-goal cushion despite some strong play by the Dingo backlines. After some strong words at half-time by the coaches, the Dingos stormed back on to the field re-envigorated and determined to turn the match on its head. A key switch of D'Arcy Hill to ruck freed up team captain Tom Bell to roam the half-foward line as a link to fowards Mick and Wade, fending off Eagles' Tasos Dimacakos in the process (still one of the league's premier defenders). Like lightning in a bottle, the Dingos came alive, scoring three straight goals and dominating the overall play thanks to some great, composed work out of Shaun McKay, Justin Robertson and James Duggan, the latter of whom was tagging Eagles' mid-fielder Ralph Koens. The momentum held right up to the final minute of the 3rd quarter, when a costly mistake (of the 50m variety) followed by a poorly-timed loss of temper (of the second shot at goal variety) awarded the Eagles two easy goals and made the mountain that much taller. In the end, it was these two costly, undisciplined goals that were the difference in the match, as the Dingos held the Eagles completely scoreless in the 4th quarter but couldn't get it through the centre posts just one extra time. As the final minutes ticked away, the Eagles played a game of keep away instead of attacking, forcing the Dingos into some costly mistakes and giving them the tiny 3-point victory. Best on ground mentionings were given to Wellsy & Mal for their great work in the backline, Jimmy for his tough assignment in the middle, and Mick for his tireless leading in the forward line. Overall BOG was awarded to Wade, who led the way with 5 goals and was all over the field through 4 quarters. Details for this match can be found here. Photos can be seen here courtsey of Niamh Harmon. Next up, the Dingos square off against the High Park Demons, who have struggled thus far but are just two spots below the Dingos on the ladder.